Ever get tired of your big bulky keychain , clanging or dangling, or just getting in the way? Keysmart is where it's at! I have had a bulky keychain for years now . I've bought multiple carabiners, quick releases, and cable key chains , to try and organize the clump of keys. Nothing ever brought the bulkiness of the keys down, just organized. Until I heard of @GetKeySmart ! I happened to find them stumbling through my Twitter feed , during the mass of Black Friday sales. Soon as I saw it I had to order one! I got it in the mail and have been using it for about a week now. I love it! 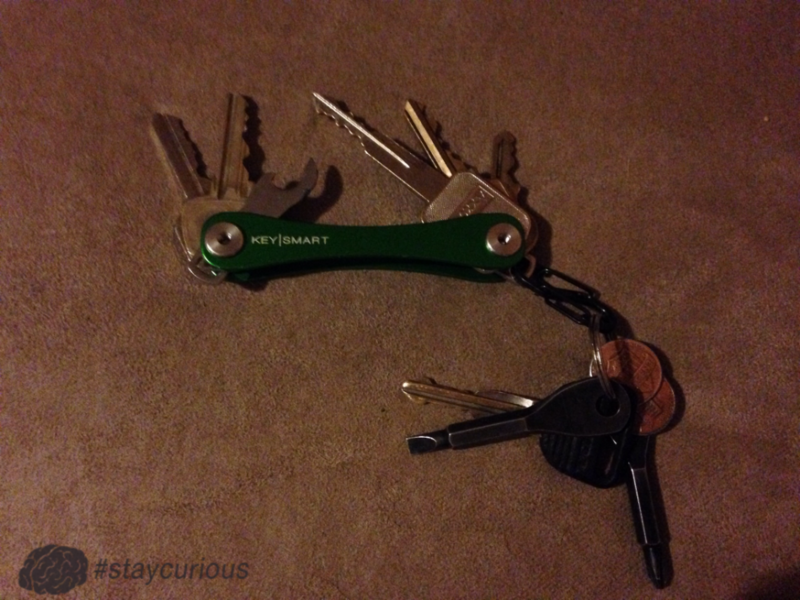 I purchased the KeySmart Extended, with the expansion pack from 2-10 keys, a add-on bottle opener and quick release. Link here to order what I received ;). 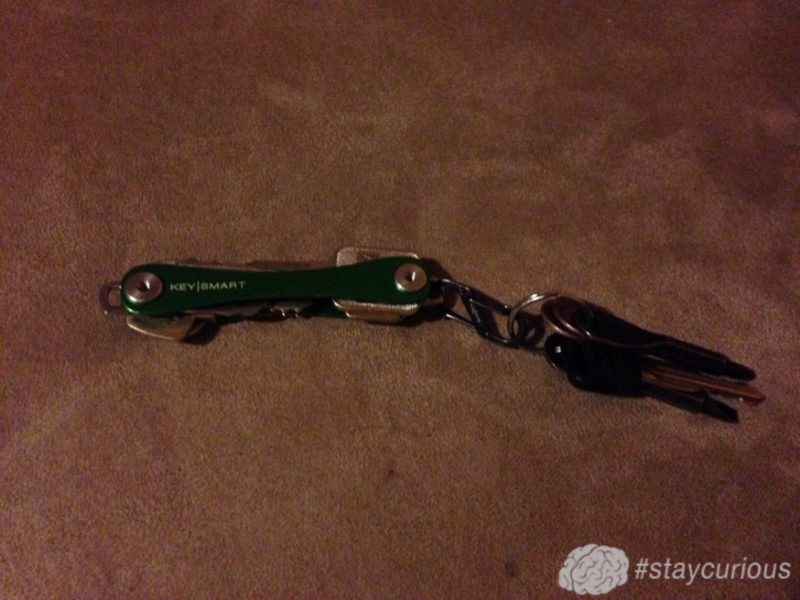 So the KeySmart is like a Swiss Army knife for your keys. Eliminating key rings completely with a aluminum anodized swivel system. You can see the two outer pieces of green anodized aluminum, spacers, end caps to screw on, bottle opener, keychain attachment, and expansion pack is in the little baggie to the right. The expansion pack consists of extra spacers, and two rods, with threaded female/male ends on opposite sides. You screw these in where the end caps would go, and it widens the entire assembly to accommodate more keys. I've got 5 keys, a bottle opener, and a keychain accessory with quick release to attach my car keys and screwdrivers . This all folds up into a thin compact , pretty neat looking key accessory. Now you can buy yourself one of these at GetKeySmart.com starting at just $19.98, up to $48.98 for the Titanium Edition :). You can also add expansion packs for up to 50 keys! Those range from +1.98 up to $14.98. In addition to the Bottle Opener (+$2.98) and Quick Release (+$2.98), there is also a Pocket Clip (+$9.98) and a Quick Retract (+$4.98). To really up the ante with the KeySmart, you can also add a swivel USB stick! Ranging from 8GB-64GB (+$9.98-$48.98). That's a lot of accessories that you could add to one of these, mine costing right under $30.00 is a steal for something you use, every day, multiple times. But, @GetKeySmart has offered to give a KeySmart away for FREE! Here at Curionic.com ! That's right! You can get your keys organized yourself for completely free, just by following the steps below. You can pick one task, or do them all! The more you do, the better your chance is at winning! A BIG thank you to GetKeySmart.com and @GetKeySmart for hosting this awesome giveaway! Ends January 11th, midnight. Winner will be notified by Direct Message, and/or email. Address required for direct shipment from GetKeySmart.com. Wyoming only has Two Sets of Escalators.